Boil spaghetti as usual: Put lots of water in a big pot and let it boil on high fire. When it boils, add a handful of salt and spaghetti and mix well. Let it boil mixing in the meantime. When spaghetti is done at your preference, drain it. In the same pot add olive oil or butter until you cover the bottom of the pot. 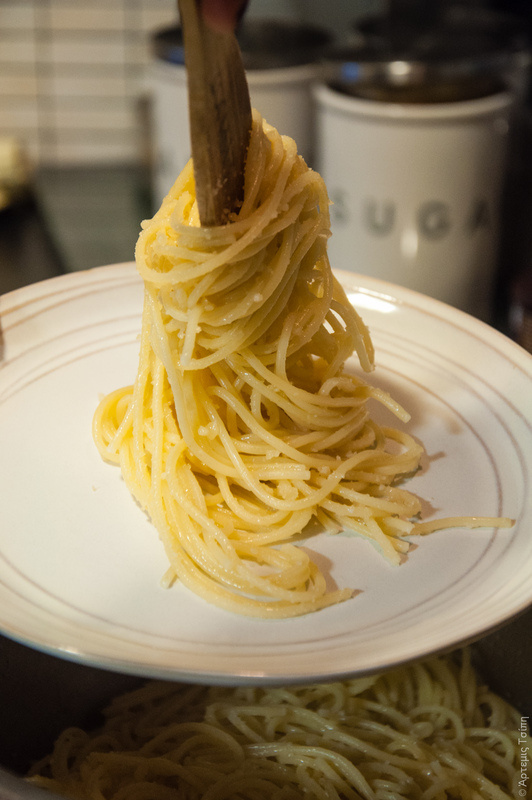 Let it heat very well and pour in spaghetti. Mix well until all spaghetti is greased. Add lots of grated cheese and mix well -add as much as you like. Set aside. 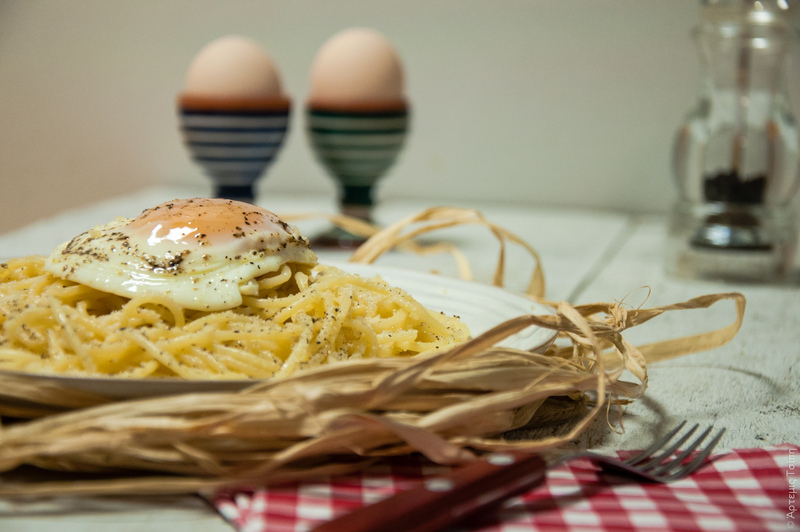 Fry some eggs: in a frying pan with some olive oil which is hot, add carefully as many eggs as your portions of spaghetti. Fry your eggs at your preference as well, adding some salt and lots of pepper. 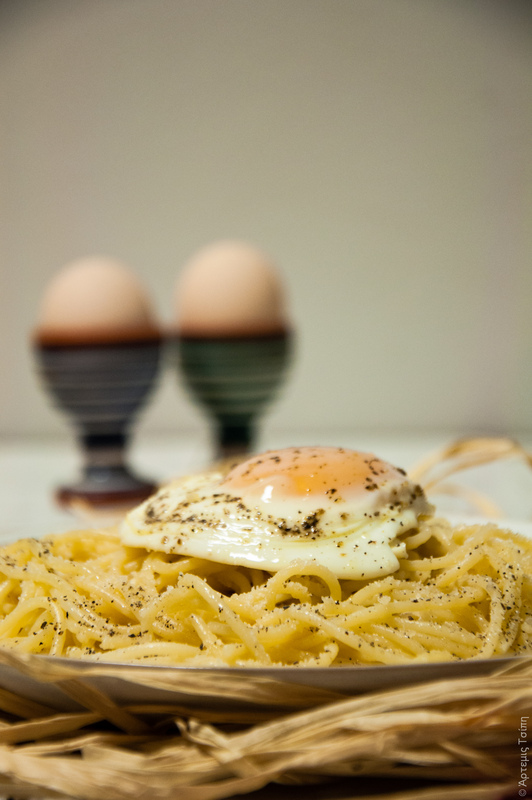 Serve spaghetti in plates, add one egg on top and some extra cheese and pepper if you like. Eat it hot with some fresh bread. ← Nut about nuts! Roasted, caramelised, spicy almonds. yummy, simple, good and always comforting type of food. If it’s for my yolk, oh yes I can! This recipe is very similar to a classic dish from Mani! Baked pasta with eggs on top and plenty myzithra! My grandpa used to love this dish! Simply delicious! Well, it really is from Mani -i noted down at the end of the post 🙂 I’m glad you know it!